When you think of ROI, monetary returns spring to mind – particularly if you have stocks. But there are other, crucial factors of ROI to do with savings and increases. The right investments can save you time, effort, resources, and sometimes even your sanity. And increases gained can include efficiency, productivity, the speed of getting the job done and much more. When you purchase a new laptop, you may not realise it, but you’re probably thinking about savings and increases. How much faster will the laptop work? How much more can you get done in less time with a more efficient processor? When it comes to business management software, it’s the same situation. Sure, there’s a monetary factor. The right ERP software can help you increase sales and grow your revenue. But it can also help reduce time-consuming processes through automation, do more with fewer resources, get your operations running more efficiently, and make your team more productive. There are a lot more ROI benefits to leverage from an ERP implementation. So, if you’re considering an ERP system, be sure to start out with the right strategies that will help maximise ROI, faster. Analyst firm, Gartner, estimates that 55% to 75% of all ERP projects fail to meet their objectives. Common causes of failure include inadequate communication and planning, poor change management and constant adjustments to business objectives during the implementation process. If you’re considering an ERP system to help your business grow faster and improve profit, getting your ERP implementation right is a crucial ingredient. And seeing a strong return on investment from your ERP software hinges on the implementation. Here are the top 6 strategies to help you see ROI from your implementation sooner. When scoping an ERP solution, choose software that’s designed for the needs of your business and industry. Look for functionality that addresses your core processes and business requirements. Spend some time jotting down the current pain points and issues that you and your team are having with your current systems. Are you spending too much time rekeying data from one system to another? Or you see errors in your critical business data as a result? Are there specific business reports you need as standard? Ask your team for their input and prioritise the impact of the current issues. If you’re not sure how to get started, talk to the ERP provider you’re considering working with. They’ll often have a wealth of experience and advice about what to consider. Think of your relationship with the ERP provider as a partnership that can aid the success of your implementation. Don’t be afraid to ask for their advice. Any good solution provider will already regard this as a necessary part of the process. Have a further read of our post, ERP software comparison: how to plan the right choice, for some additional tips on what to look for and what to expect from an ERP solution provider. Studies have shown that customisation is a leading factor of why implementations can take longer than expected and incur higher costs. Think about how you want to start off with your ERP system. Do you want to start simply and quickly, planning for additional functionality or customisations is a second phase of your project? Or do you have specific requirements that need to be met as part of the initial set up? It can help to work with an ERP solution provider to clarify what your business needs early on. Scoping your ERP implementation project appropriately and considering customisations or additional functionality, whether that’s immediately or in a second phase, can help set the right timeframes and expectations. A standardised ERP implementation isn’t right for every business. But for those wanting to get up and running with financials and inventory as soon as possible, it can be a wise decision that lets you see ROI very quickly. Once you’re up and running, you can continue to work with your ERP provider on customisations and expanding functionality to drive value from your software investment even further. Work with your ERP provider to establish the right plan for your continued implementation goals beyond your initial ‘go-live’ phase. It’s crucial to understand the differences between two main types of ERP systems in which you can invest. You can purchase an on-premise ERP system and install it on your own physical computers and servers. Using an on-premise option, the software is installed on your physical servers. To keep your ERP technology current, you’ll need to perform regular testing and upgrades of the software. You’ll need the knowledge and resources in-house to do this or pay for an IT technician to help. You might also need to schedule windows of down time for the work to be done or organise out-of-office hours to manage updates. Be mindful of how you plan this out as it can run the risk of affecting productivity, as well as any customisations and integrations you’ve set up, if not handled correctly. On-premise ERP software generally incurs a much larger upfront investment. You’ll need to consider costs for the software, the hardware and the resources to maintain and upgrade both the software and the hardware. The other option is cloud-based ERP software. Your system is always securely accessible in the cloud and the infrastructure is managed by your ERP provider. You don’t have to spend anything on hardware or invest in resources to maintain or upgrade the system – that’s all handled by the ERP software vendor. This gives you an ERP solution that is always current, without the down time or additional resources needed to manage regular upgrades. Implementation can also be much simpler – and faster. Cloud delivery gets you system access as soon as your software licenses are provisioned. Your ERP provider can start working with you sooner to implement your system. ERP implementations require dedicated time, planning, training, communication and documentation. Those factors apply added pressure to the day-to-day business responsibilities and operations of your team if not handled the right way. Larger enterprises have the resources to assemble ERP implementation teams to manage the entire process. But for growing businesses, that’s not as feasible. Investing in a cloud-based ERP implementation service can take some of the burden away from your employees and free them up to focus on other tasks. 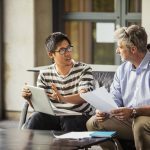 A good cloud ERP provider will drive training as part of the implementation process – letting your team learn throughout the setup. Delivery is often managed by web conferencing to help get all stakeholders involved in the setup, no matter where they are, to speed up the process and maximise value. Make sure your ERP provider also offers a knowledge base of information to support your employees. Pre-defined reference material, processes, help articles and FAQs can be a quick ‘lifeline’ for your team the moment they need answers. Any new system of process will need your team to adapt, and it’s a factor for which you should be prepared. Get your team’s buy-in. Include them early on in the ERP implementation process. Spend the time you need on change management. And when your ERP implementation is complete, think about ongoing training to keep your team using the system to its full potential. The more effectively everyone is using your ERP software, the better ROI you can expect to see. Identify all stakeholders and make people accountable. Outline the ERP implementation schedule and go-live date. Detail all the various stages of your implementation and key milestones. Provide information, such as FAQs, on the ERP system’s functionality. Promote scheduled demonstrations and any testing requirements. Letting stakeholders and your ERP implementation team know how many hours a week they should set aside for reviewing changes and updates, testing, training and helping to define any new processes. Allow plenty of time to train users on the new system – during and after the implementation – so they can hit the ground running and continue maximising use of the system (and the ROI you’ll gain from it) after your implementation is live. Don’t be afraid to re-set expectations – if unexpected factors arise during implementation, account for them in your implementation timeline and update stakeholders with new timeframes. 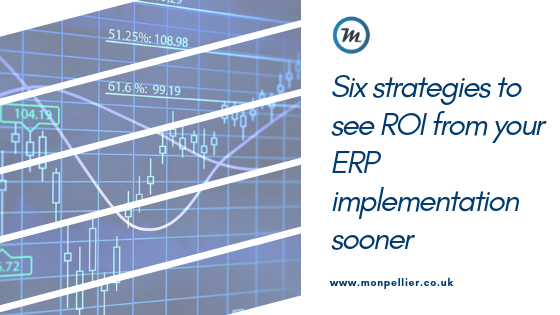 These 6 strategic steps can help you see ROI that targets savings and increases that the right ERP implementation can bring to your business. And all this leads to greater profitability. Having an experienced implementation provider to work with you through the process can make all the difference. Be sure to ask the ERP provider you’re considering about the number of ERP implementations they’ve successfully completed. Look for customer testimonials to understand how the solution has worked for other businesses. Start preparing your ERP implementation checklist to make sure you’re taking all requirements into account. And when you’re ready, reach out to an ERP provider for a tailored demo that focuses on what you want to get out of the system. Are you ready to reach out to a request a demo of an ERP system? Then we can help! Drop us a message here, or give us a call on 0191 500 8150 to speak to a Business Software Consultant.